Charlie Comerford was more than a Facebook Friend. He became a real friend, he regarded me as his cousin, and when he became an Anglican and was received into full membership of the Episcopal Church, he asked me to be the equivalent of his godfather. We became friends on Facebook over 7 years ago, in August 2010 through the suggestion of Rory Murphy in Bunclody, Co Wexford. Charlie believed his great-grandfather was from Bunclody, although his birth certificate says he was born in New York, and we shared a lot of time trying to find our shared ancestors and links of kinship in Co Wexford. 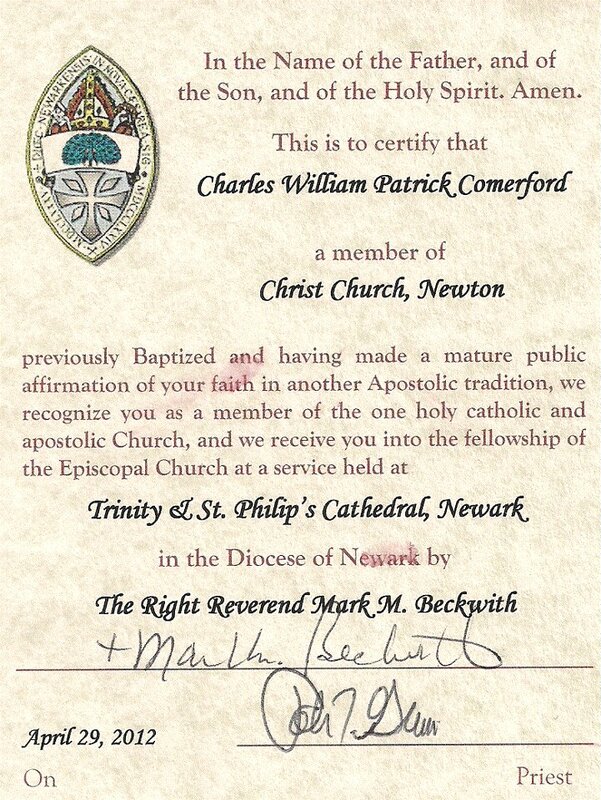 He took my name as the equivalent of his ‘confirmation’ name when he was received into the Episcopal Church on 29 April 2012, by Bishop Mark Beckwith of Newark in Trinity and All Saints’ Cathedral, Newark. From then on, he gave his full name as Charles William Patrick Comerford, which was an honour and a privilege I would never have sought or requested. Charlie frequently reposted my postings from Christ Church Cathedral, Dublin, and other churches, my posts on liturgy, church history, family history, travel and even some of my sermons, as well as postings from Lichfield and travel throughout England and Europe. He became an Anglo-Catholic in his expression of his Anlicanism. Eventually, we met two years later in Dublin on May 2014. 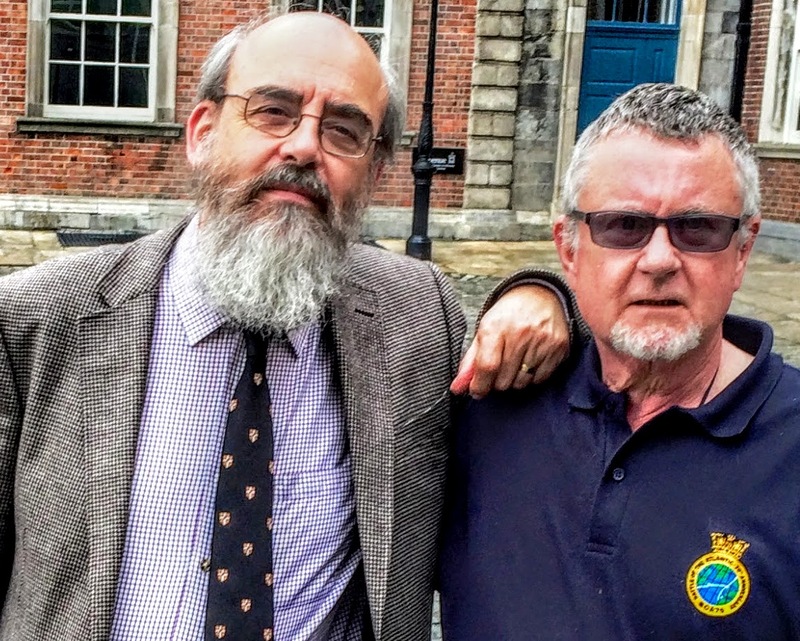 He had a quick one-day visit with his friend Bill Cross from Liverpool, and we visited Christ Church Cathedral, Dublin Castle, including the Chapel Royal and the Throne Room, Trinity College Dublin, including the Book of Kells and the Long Room, and the Mansion House. We ended up in a pub in Temple Bar, discussing ties of kinship, Irish pubs, de Valera’s place in Irish history, and the Book of Common Prayer of the Episcopal Church (TEC), before Charlie and Bill set off to catch the last flight back to Liverpool. He left me with a copy of the Book of Common Prayer of the Episcopal Church. We found we shared a number of Facebook friends, including Father Peter Pearson. He was delighted when Norman Lynas, canon residentiary of Holy Trinity Cathedral in Hamilton, Bermuda, was a visiting preacher in his parish church and realised that we had been friends and colleagues in Ireland for many years, including serving together on the board of the Church of Ireland Gazette. While we did not always see Irish history and politics in the same light, we certainly shared the same outlook on recent political developments in the United States. At the end November, he shared his pleasure that Archbishop Justin Welby of Canterbury had spoken out about American Christians who supported Donald Trump. Charlie celebrated his birthday last month, on 8 November. But recently he was spending a lot of time at Memorial Sloan Kettering Hospital in New Jersey. He was treated for throat cancer and a chest lymph node and he visited thoracic surgeons, although he denied he was in any real physical pain. 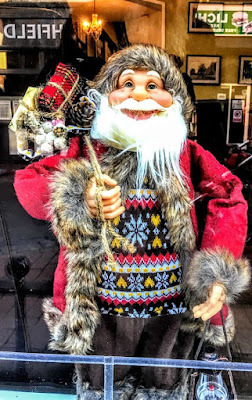 Still ever hopeful, he was planning another trip to Ireland and Britain, and had hoped this would happen last month or this month, in late November or mid-December, visiting London and Liverpool, spending five days in Ireland, and visiting Dublin, Limerick and Askeaton. His next chest scan was brought forward to early December from early January, and so the next trip was delayed. He was still hoping to see me in Ireland early in 2018. Last weekend, he was taken into Morristown Hospital for pneumonia and with a bad pain in his left lung. He was moved to the ICU on Thursday, and his condition has worsened on Friday. The doctors were not sure what was wrong. His condition worsened and there was no hope for improvement. Charlie died late on Saturday afternoon. His death was peaceful and he was surrounded by friends and family. The Second Sunday of Advent. 11.30 a.m.: Holy Trinity Church, Rathkeale, Co Limerick, Morning Prayer. Readings: Isaiah 40: 1-11; Psalm 85: 1-2, 8-13; II Peter 3: 8-15a; Mark 1: 1-8. 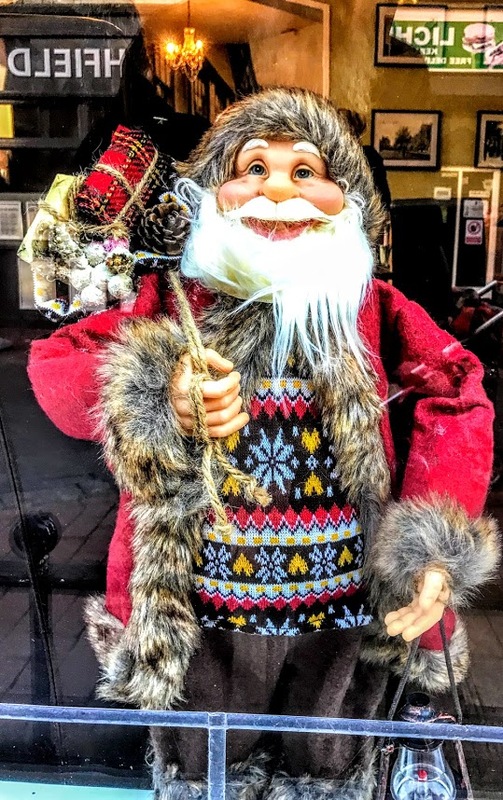 Last week, I explained in Askeaton and in Tarbert that on each Sunday in Advent, instead of preaching one long sermon, I’m going to offer three short reflections: looking at the Advent Wreath and Candles; looking at the Gospel reading and our hopes for the Coming of Christ; and looking at the meaning of Santa Claus. In Year B in the Lectionary readings, we are focussing on Saint Mark’s Gospel. Last Sunday, we heard his account of the Coming of the Son of Man (Mark 13: 24-37). This morning, we return to the beginning of this Gospel (Mark 1: 1-8). While Saint John’s Gospel begins at the beginning of Creation (‘In the beginning was the Word, and the Word was God,’ John 1: 1), Saint Mark, unlike Saint Matthew or Saint Luke, has no Nativity narrative, has no story of the first Christmas (see Matthew 1: 18 to 2: 23; Luke 1: 1 to 2: 40). Saint Mark begins his Gospel with his account of the Baptism of Christ by Saint John in the River Jordan, which comes later in the other three Gospels (see Matthew 3: 1-17; Luke 3: 1-21; John 1: 19-34). Indeed, there is no Christmas story in Saint Mark’s Gospel. Instead, the theme for the readings this morning is the Prophets, and then next Sunday [17 December, Advent III), we look at Saint John the Baptist, who in his own way is the last in the line of the Prophets, the bridge between the Prophets and Christ. The prayers at the Advent Wreath on the Sundays in Advent can help us to continue our themes from the Sunday before Advent [26 November 2017], which we marked in these dioceses as Mission Sunday, supporting projects in Swaziland in co-operation with the Anglican mission agency, the United Society Partners in the Gospel (USPG). As we light our Advent candles in anticipation of celebrating the coming of the Christ child, USPG is inviting churches and parishes to pray for mothers and children who are served by USPG in the world church in Tanzania, Ghana, Bangladesh and Palestine. The first candle to light on the Advent Wreath on the First Sunday of Advent was the Purple Candle, recalling the Patriarchs and Matriarchs, our fathers and mothers in faith, like Abraham and Sarah, Isaac and Jacob. The purple second candle, which we light this Sunday, represents the Prophets. who have learned to protect their children from cholera. and bless families whose children are now healthy and full of life. May I speak to you in the name of God, + Father, Son and Holy Spirit Amen. Our Old Testament reading (Isaiah 40: 1-11) is familiar to many of us because of the opening words of Handel’s Messiah. The promise of the Prophets is central to our understanding of waiting and hope in the weeks of Advent, the weeks immediately before Christmas. In the Psalm (Psalm 85: 1-2, 8-13), we also hear God’s promise that he will bless the people with peace and steadfast love, which shall be the visible signs of God’s presence and power (verses 8-13). In the Epistle reading (II Peter 3: 8-15a), Saint Peter, by now at the end of his life, leaves an assurance of the fulfilment of God’s promises. Now, in the Gospel reading (Mark 1: 1-8), the story of the Baptism of Christ gives us the first revelation of the Trinity to the creation in the New Testament. It is like the story of a new creation. God’s promises, expressed by the Prophets and the Psalmists, are being fulfilled. But rather than retell those stories, as my commentary on our readings and as the second part of my sermon this morning, I want to read a letter I received a few days ago in an email from another Mark, the Revd Mark Aitken, Master of the Royal Foundation of Saint Katharine in Limehouse, in the East End of London. It is very strange that the time of the year which should be greeted with awe, wonder and bated breath; a time which should be focused on the kind of quiet that we hold so a baby won’t wake, is actually greeted with crackers, the loud singing of carols and noisy parties. In the middle of winter, in a time of political uncertainty, and with many people living under all kinds of pressure, a reason to be cheerful should be grasped with both hands. A season of goodwill and glad tidings feels very necessary. However, what if there were more than just an excuse for a midwinter party going on here? What if Christmas Day could be a day to astonish us and fill us with wonder, cut through our chatter, reduce us to silence and possibly bring us to our knees? It could be in church, or as you sense the overwhelming love offered to you in a thoughtfully chosen present, or just in a stolen, quiet moment in the middle of a party, that your thoughts will turn to that child born in a dark stable, in the middle of the night all those years ago. You might even catch your breath, feeling a deep longing inside you, and sense the gentle hint that this child will have something to say to you when he grows up. Last Wednesday, we recalled the real Santa Claus, Saint Nicholas, during our mid-week Advent Eucharist in Saint Mary’s Church, Askeaton, and last Sunday I spoke a little about Saint Nicholas and his willingness to go to Alexandria, where God sent him, as a real example among the saints of how life is a pilgrimage, an Advent, that looks forward to the coming of Christ and his Kingdom. That funny hat that Santa Claus wears is derived from the mitre that Saint Nicholas wore as Bishop of Myra. Saint Nicholas’s election as bishop was unusual. After the former bishop died, other bishops gathered to elect the next Bishop of Myra. As they met, the wisest bishop heard a voice in the night telling him to watch the doors of the church the next morning at Matins. The first person to enter named Nicholas was to be the new bishop. The wise one told the others, asking them to be at prayer while he waited at the doors. When the hour came, the first to arrive was the young man who had just arrived back from Alexandria. The bishop said to him: ‘Nicholas, servant and friend of God, for your holiness you shall be bishop of this place.’ They brought him into the church and placed him in the bishop’s throne where he was to be consecrated the new Bishop of Myra. Myra suffered famine in the years 311, 312, and 333. The crops failed, and the people were hungry. Bishop Nicholas learned that ships bound for Alexandria with cargoes of wheat had anchored in the harbour. The bishop implored the sailors to take a measure of grain from each ship so that the people would have food. The sailors said ‘No’ as the wheat was ‘meted and measured’ and every bit must be delivered. So, the sailors took a measure from each ship and continued on to Alexandria. When the wheat was unloaded, the full amount was accounted for. When the tale was told, the emperor’s ministers all worshiped and praised God with thanksgiving for his servant Nicholas. Throughout the famine people came to Bishop Nicholas for wheat. He gave it to all who had need, and the grain lasted for two years, with enough remaining to plant new crops. It’s a story that can remind us of Christ feeding the multitude with five loaves and two fish. But it also points to the generosity of Christ giving himself to us in the Eucharist or Holy Communion, and to the generosity of God in sending us the most wonderful gift of Christ at Christmas-time and the promises of the generosity and blessings of the Kingdom of God. And so, may all we think, say and do be to the praise, honour and glory of God, + Father, Son and Holy Spirit. Amen. and let your anger cease from us. that glory may dwell in our land. through Jesus Christ our Lord. one God, now and for ever. (Revd Canon Professor) Patrick Comerford is Priest-in-Charge, the Rathkeale and Kilnaughtin Group of Parishes. This sermon was prepared for the Second Sunday of Advent, 10 December 2017. 9.30 a.m.: Castletown Church, Kilcornan, Co Limerick, The Parish Eucharist (Holy Communion). Indeed, there is no Christmas story in Saint Mark’s Gospel. Instead, the theme for the readings this morning is the Prophets, and then next Sunday, [17 December, Advent III), we look at Saint John the Baptist, who in his own way is the last in the line of the Prophets, the bridge between the Prophets and Christ. As we light our Advent candles in anticipation of celebrating the coming of the Christ child, USPG is inviting churches and parishes to pray for mothers and children who are served by the USPG in the world church in Tanzania, Ghana, Bangladesh and Palestine. The first candle to light on the Advent Wreath on the First Sunday of Advent was the Purple Candle, recalling the Patriarchs and Matriarchs, our fathers and mothers in the faith, like Abraham and Sarah, Isaac and Jacob. The purple second candle, which we light this Sunday, represents the Prophets. Last Wednesday, we recalled the real Santa Claus, Saint Nicholas, during our mid-week Advent Eucharist in Saint Mary’s Church, Askeaton, and last Sunday I spoke a little about Saint Nicholas and his willingness to go to Alexandria, where God sent him as a real example among the saints of how life is a pilgrimage, an Advent, that looks forward to the coming of Christ and his Kingdom. here you have nourished us with the food of life. and to yearn for things heavenly. We ask this through Jesus Christ our Lord. USPG: In partnership with the Anglican Church in Ghana from USPG on Vimeo. Today is Second Sunday of Advent, and we are beginning the second week of Advent. This morning’s theme, as we light the second, purple candle on the Advent Wreath in many churches is ‘The Prophets.’ This theme may also run through the readings, hymns, prayers and sermons in churches. Later this morning [10 December], I am preaching and presiding at the Parish Eucharist in Castletown Church, Kilcornan, Co Limerick at 9.30, and leading Morning Prayer and preaching in Holy Trinity Church, Rathkeale. Throughout this season of Advent, I am spending a short time of prayer and reflection each morning, using the prayer diary of the Anglican mission agency, USPG (United Society Partners in the Gospel) and the Advent and Christmas Devotional Calendar from Lichfield Cathedral. USPG, founded in 1701, is an Anglican mission agency supporting churches around the world in their mission to bring fullness of life to the communities they serve. Under the title Pray with the World Church, the current prayer diary (22 October 2017 to 10 February 2018), offers prayers and reflections from the Anglican Communion. This week, the Prayer Diary continues its Advent series, looking at how the church is reaching out to mothers and babies. This week, it says, ‘we look at a USPG-supported Anglican health programme in Ghana that has helped to eradicate cholera in parts of the Cape Coast. My name is Gloria. I have two children, aged three and one-and-a-half years old. The health programme has helped me and my family. Before, I didn’t know I needed to wash my children’s hands with soap and water before they eat. They would be playing, but I wasn’t washing their hands afterwards. But now, because of the programme, I make sure I wash their hands. Also, before the programme, whenever I bought fruit and vegetables from the market, I wasn’t washing them. But not I wash them with a soap and salt solution before I use them to prepare food. Another thing I learned was that before breast-feeding my baby I first needed to wash my breasts. I learned that a child can contract diseases if I do not wash in this way. Before the programme, I was not outing these things into practice and my children, in fact the whole family, would visit the hospital a lot because of diarrhoea and sickness. But now it is five months since we visited hospital. and give thanks for children now healthy and full of life. The calendar suggests lighting your Advent candle each day as you read the Bible and pray. Today, the calendar suggests going to church and reading Matthew 17: 9-13. 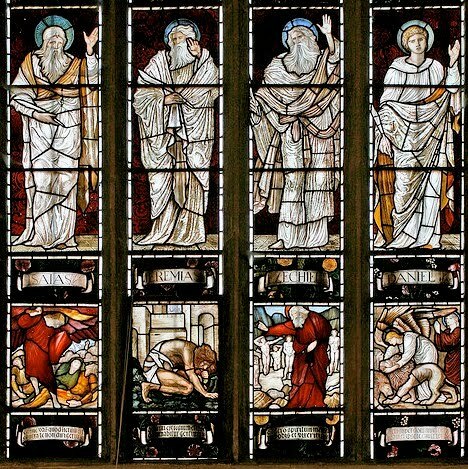 As Advent unfolds think of the muddle and confusion that stops us understanding God’s truth. Pray for light. Isaiah 40: 1-11 Psalm 85: 1-2, 8-13; II Peter 3: 8-15a; and Mark 1:-8.